This two-story limestone rock and adobe building was built by Thomas O. Larkin in about 1845. Several years later, Joseph Boston leased the structure to operate one of the first general merchandise stores in the area. The actual date of opening is said to have been between April, 1849 and April, 1850. A surprising assortment of goods was sold during this period. Items available for purchase included: silverware, pans, coffee mills, tubs, brooms, walnuts, tea, hams and soap. Boston literally offered everything from garden seeds to grinding stones! The first safe in Monterey was installed in Boston's Store. Local legend claims that miners returning from the gold fields often stored their assets there. This led to the designation "Casa del Oro" or House of Gold. Today, one can still find the original safe and Boston's office desk on display. Today, this Historic California Landmark is operated by the Historic Garden League, a non-profit dedicated to preserving the historic gardens of Old Monterey. Respecting the store's past as the first mercantile store in Monterey, the Historic Garden League offers merchandise themed to the 1850s, along with artisan products such as soaps, elderberry cordials and syrups, jam, honey, olive oil and balsamic vinegars, as well as teas created by local residents. Throughout December, the Joseph Boston Store is known for its stunning Victorian and vintage decorations and products. 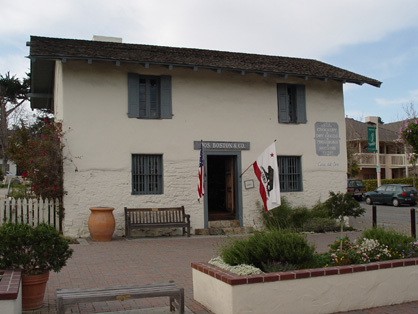 It opens its doors for the annual Christmas in the Adobes, a well-loved event hosted by Monterey State Historic Park Association. Open Thursday thru Sunday; 11am - 3pm. Procedes support the preservation of the historic gardens of Monterey. Located at 210 Olivier Street off Pacific Street. Operated by the Historic Garden League of Monterey.